This is members only feature. If you are already a member, please sign in or you can sign up for free. Nature's Sleep claims that their 12" high Sapphire Gel Memory Foam Mattress is the "#1 Mattress for relieving back pain." This claim is based on their claimed use of higher-density memory foam than other manufacturers, a layer of gel-infused memory foam almost half the height of the support core, and an inch of memory foam in the quilting. Starting at the top, the cover of the Nature's Sleep Sapphire Gel Memory Foam Mattress is made of a 380-gram blend of cotton and polyester. It is listed as anti-microbial, and it has a non-skid bottom. The top panel of the Sapphire is quilted with an inch of Nature's Sleep's Next Generation memory foam to bring conformity to the top of the mattress. This cover is zippered for easy removal. Cleaning instructions are not on the description pages for this model but on a Nature's Sleep blog page. The cover is not machine washable or immersible, but can be vacuumed with a hand-held vac and spot-cleaned by hand. The support core of the Sapphire Gel Memory Foam Mattress is 7½" of high density polyurethane foam. 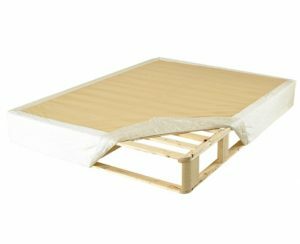 The role of this support foam is to supply underlying overall support for the mattress as a whole and for the sleepers. It keeps a sleeper from experiencing that "sinking feeling" of bottoming out. Though extra firm, this foam is more cushioning than a hard floor. Like other foams used by Nature's Sleep, this material is certified as safe by CertiPUR-US. The support core is separated from the comfort layer by a "Inner protective scrim." The signature feature of the Sapphire by Nature's Sleep is the 3½" comfort layer of proprietary Superior Gel Technology (SGT) Premium memory foam. This is memory foam infused with spheres of gel especially designed, according to Nature's Sleep, "to capture the excess heat your body emits while you sleep and whisk it away to keep you cool and comfortable." They describe this gel memory foam as "unlike all the others." While technical specifics are not openly available, the wording hints that the distinction may be in the size of the gel beads infused into the foam. The formulation of the gel is likely another factor in their claim. Nature's Sleep does not name model-to-model comparisons of their memory foam mattresses to those by Tempur-Pedic, as another manufacturer does, but some other online writers say that this company aims to produce Tempur-Pedic quality or better for a lower cost. The Sapphire Gel Memory Foam Mattress is available in four sizes: Twin XL, Queen, King and California King. Nature's Sleep provides an upholstered wood-framed base, the KD Foundation, for their mattresses, including the Sapphire, meeting the needs of memory foam beds. They also sell three models of adjustable beds. Other foundations may be suitable: "A good quality foundation, a platform bed or an adjustable base all work well." This could include European wood slats if the slats are close enough together. Traditional box springs are generally not recommended for use with this type of mattress. The Sapphire Gel Memory Foam Mattress is covered by a 20-year limited warranty from Nature's Sleep. They do not have a sleep trial perion, but some retailers do. Also, most retailers have prices significantly lower than those posted by the manufacturer. You may scroll down and submit your membership now, or take the optional survey below to be entered into our drawing for cash and prizes! Question 1 : What type of mattress do you currently sleep on? Question 2 : How long have your owned your current bed? Question 3 : What is your usual sleeping position?